New Trend In Tallahassee MLS Listings: Cause For Concern? In a recent article where we took A Closer Look At The Houses For Sale In Tallahassee, we found a hearty dose of Tallahassee MLS listings that were being sold under distressed conditions. The article prompted many people to reach out to me and ask me a variety of questions, but one recurring theme related to the segmentation of the market between homes that were investments versus homes for sale for occupancy. If we look at new Tallahassee MLS listings over the past few months, priced above $100,000, a potentially disturbing trend is occurring. 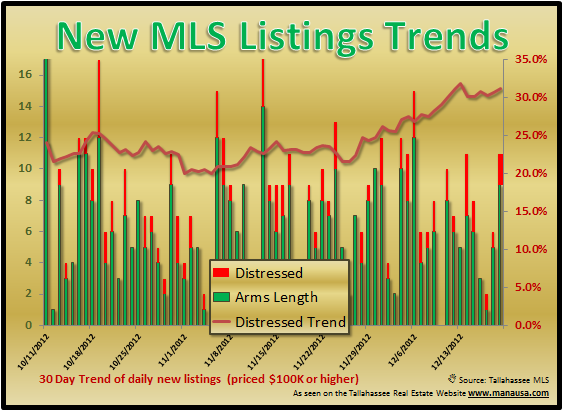 In the real estate graph below, we see that the thirty day trend of new listings above $100K is reporting significant growth in the percentage of distressed homes entering the market. So we have to wonder ... is this a short-term trend due to seasonal issues (discretionary sellers waiting until after the holidays versus non-discretionary sellers continuing to stream into the market) or are we finally seeing the wave of foreclosures that is due to arrive? Time will tell, but rest assured, we'll be monitoring and reporting about it right here! We hope this report about recent Tallahassee MLS listings has been helpful, please check back again in the future for more charts, graphs, and analysis of the Tallahassee real estate market.